Three wild celebrations on Nintendo 64 has been already hosted by our portly plumber and stakes are higher the ever with Mario Party 4 and this game features up to 50 most recent mini-games to enjoy and newest interactive game boards. Does it matter if you are a first timer in Mushroom Kingdom bash or a seasoned Mario Party vet? Of course not! No matter what, you'll have a blaze racing against your friends to go and grab every last star you can put your hands on. With Mario Party 4's Story Mode, you can throw yourself a single-player party even when your friends are grounded. The game is an action-packed fun-fest with polished graphics, unbeatable replay value great and game play variety. As your favorite Nintendo characters, you can compete in a series of contests. To be able to access different areas of the game boards and trigger special events, you can use items. In the New Tag Battle, players can compete for stars in two-man teams. For all ages and abilities, handicaps are set. A total of sixty-two mini-games that make up Mario Party 4 and these are broken down as, sixteen mini games for 4 players, nine mini games for 3v1 play, nine extra room mini games, nine mini games for 2v2 play, six battle mini games, five story mini games, and two misc mini games. The first Mario Party title on the Gamecube. 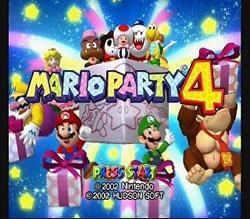 Actually, The reason behind Mario Party 4's story is that the characters are truly having a party; this hadn't been referenced in any of the games predecessors. Finally, Princess Daisy and Princess Peach change from their classic outfits.